A two part blog here. First, a bit about biking and the tri training. Remember how I wrote the other day about biking with Sue and she got three flat tires? Well, seems like the saga didn't end on Sunday. On Wednesday, I got two flats of my own, making it a total of three so far since I bought the bike a month ago. And as Liz reminded me when she came to get me 7 miles from home, it was our collective household's 4th flat tire; our car had a flat tire when we came home from vacation two weeks ago. Is my karma done yet? I think I had another defective inner tube, a bad batch of glue-less patches and the stupid cheap misfortune to not have purchased 2 spare tubes today when I went to purchase the first one. I should have known that when I filled my tires up with air and I got a flat one block away from the bike shop that it was not going to be a good evening nor would I make it to the Kelly Pool up by Memorial Hall. 'Cest La Vie. Or - don't be a cheapskate and not bike prepared. Sue, if you are reading this, you weren't the cursed one with the flats, I was the bad luck charm! Ahck! So much for trying to swim in an Olympic Length pool and getting in some serious laps. I'll try again tomorrow. Now, onto the recipes. I had an amazing lentil and egg breakfast at Sam's Morning Glory Diner last Saturday. Lentils and Eggs you say? YES! Whooping good protein. One of the breakfast specials was Red lentils with sauteed leeks, carrots, celery and bits of ham or thick cut bacon, topped with 2 Eggs and served with crisp bacon, a side of grits and their famous biscuit. I didn't say it was low-fat or healthy, it was just darn good. I skipped the biscuit (we saved it for the next day.) When you take out the bacon, lower the fat content and don't add a biscuit or butter to the grits, I imagine the overall meal could be potentially healthy as well as tasty. 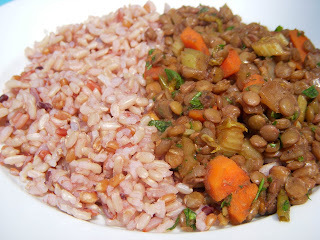 Lentils cook quickly, they are high in iron, fiber and other good for you minerals and vitamins. Plus, there are so many pretty kinds out there. My breakfast gave me energy and ideas! I've been wanting to rework another recipe liberally "borrowed" from my mostly vegetarian cookery days at the Reading Terminal Market, were we made a lentil walnut salad with blue cheese and onion vinaigrette. It was on of our most popular salads though it was probably higher in fat than I'd like to eat now. The recipe I'm posting is a newer healthier version in honor of a friend, Ms. Alison N., who asked me for some new veggie and lentil recipe ideas. Thought I'd share it with the whole blog-o-sphere world. Here you go Ms. Alison! Pick through and sort the lentils to remove any stones or debris. Rinse in a sieve or colander. Put the lentils in a small sauce pot and add 2 & 1/2 cups of cold water and the bay leaf; bring to a boil and then turn down to a simmer. Cook lentils until they are al dente, not too crunchy and not mushy. If needed, add more water to the pot if the water is absorbed too fast. Cooking time will vary - figure on at least 15-20 minutes. Drain the lentils after they are finished cooking and spread the cooked lentils onto a sheet tray to cool in an even shallow layer; discard the bay leaf and set the lentils aside to cool. Heat 1 tablespoon of olive oil in a saute pan over medium heat until it shimmers. Saute and sweat the carrots, celery and onions until the onions and celery turn translucent and the carrots become knife tender (retaining a bit of bite), 3-5 minutes. Add in the garlic, stirring to combine and saute another 1 minute. Add in the balsamic vinegar and turn up the heat to high; reduce the balsamic to a few tablespoons - about 3-4 minutes. Stir in the bullion cube broth and reduce the liquid down by half - 5 minutes. In a large mixing bowl, combine the cooked and cooled lentils with the vegetable mixture with its balsamic bullion broth. Stir in the toasted walnuts and season to taste with freshly ground pepper, and if using, the crumbled bleu cheese. Garnish with the chopped parsley and if need be, adjust seasonings with more pepper and pinch of salt. Serve with Cooked Brown Rice or a Multi-Grain Rice Medley, hot, warm or even cold. Sorry about your woes. Did you need a new saddle? Nice new blog picture! This lentil thing sounds awesome!